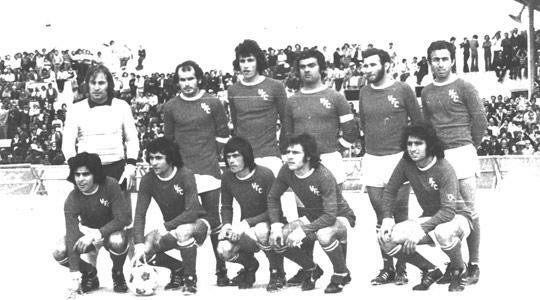 Valletta secured the title in 1973-74 after claiming a last-gasp win over Hibs. The coveted Premier League title will be at stake when Hibernians, the current leaders, take on Valletta on Sunday. Leading Valletta by two points, Hibs will be crowned champions for the tenth time if they gain at least a point on Sunday. Valletta need a victory to overhaul Hibs and capture what would be their 20th league success. As part of the build-up for what promises to be a compelling match, The Times recalls three classic encounters between Hibs and Valletta. The situation at the top in the concluding stages of season 1973-74 was pretty much the same as this year but the roles were reversed. Valletta had a one-point lead over Hibs going into their direct clash on the penultimate day of the season, meaning that a draw would have kept the Citizens clear of their rivals before their final matches. At the time, two points were awarded for a victory. On the other hand, Hibs were faced with a must-win scenario to claim pole position and strengthen their title quest. Both teams created some scoring chances during a nervy encounter. The match seemed headed for a goalless stalemate which would have delayed the title verdict until the final day but a dramatic finale ensued. No more than a minute remained when referee Edwin Borg awarded Valletta a free-kick for a dubious foul on Norman Darmanin Demajo on the edge of the penalty box. Sensing the looming danger, Hibs got all their players behind the ball in an attempt to defend their goal but Tony Giglio broke their hearts as his swerving free-kick flew through a sea of opponents and past a startled Freddie Mizzi in the Hibs' goal. Giglio's last-gasp winner assured Valletta their first title in 11 years as the Citizens opened an unassailable three-point gap at the top with only one match left. Valletta: Debono, Galea, Gauci, Vella, Borg, Ciantar, Agius, Darmanin Demajo, Fenech, Giglio, Seychell. Hibs: Mizzi, Privitera, Carter, Gouder, Zarb, Delia, Vella (Cauchi), Muscat, Cini, Theobald, Spiteri Gonzi. Hibernians clinched the title after beating rivals Valletta in a seven-goal thriller at a buzzing National Stadium. The Paolites, under the guidance of English coach Brian Talbot, went into their penultimate league match with a one-point advantage over Valletta but the latter looked well on their way to a potentially decisive victory after surging into a two-goal lead inside the opening 27 minutes. Jeffrey Chetcuti opened the scoring for Valletta. The left-back made a terrific run and fired an unstoppable shot past Mario Muscat after exchanging passes with Joe Zarb. Valletta made it 2-0 on 27 minutes, Zarb nodding home from a goalmouth melee. But, Hibs got back into the game in first-half stoppage time thanks to George Lawrence's acrobatic volley after Valletta goalkeeper Slobodan Janjus had fumbled Robert Docherty's corner. Janjus continued to play the villain of the piece when, nine minutes into the second half, his mistimed sortie left the way clear for David Carabott to lob the ball into the net. Galvanised by their equaliser, Hibs continued to press forward but Valletta regained the lead when Jason Kabia flicked past Muscat after receiving from Gilbert Agius. Having thrown away a two-goal cushion, Valletta thought that Kabia's goal would knock the stuffing out of Hibs but they were wrong. Hibs got back on level terms within five minutes of Valletta's third goal, substitute Michael Taliana firing home after Carl Zachhau's mishit attempt rolled into his path. In no time, Hibs were on target again. Their winner came from a devastating counter-attack as Lawrence released Zachhau who deposited the ball home with panache. Valletta's misery was complete when defender Joe Camilleri was red-carded for dissent in the dying moments. Valletta: S. Janjus, J. Chetcuti, J. Camilleri, K. Laferla (J. Agius), D. Debono (R. Sciberras), E. Lufi, G. Agius, N. Saliba, J. Kabia, J. Zarb, J. Zerafa. Hibs: M. Muscat, L. Attard, E. Camilleri, S. Camilleri (M. Taliana), M. Woods, M. Spiteri, C. Scerri, G. Lawrence, C. Zachhau, R. Docherty. Only one point separated Hibs and Valletta when these two title contenders locked horns on the 16th day of the 1994-95 campaign. Victory for either side would have strengthened their chances of landing the championship and it was Hibs who emerged on top after edging the Citizens by the odd goal in three. For all the attacking players on view at the National Stadium on that April afternoon, it was a defender who stole the limelight after Lawrence Attard scored the two goals that enabled Hibs to close in on their second consecutive title. Attard put Hibs ahead on the stroke of half-time with a glancing header from Robert Docherty's corner. The towering defender underlined his aerial prowess 18 minutes into the second half. David Carabott delivered an inviting cross from a corner, George Lawrence laid the ball back to the steaming Attard who headed home. With Valletta looking demoralised, Attard might have completed his hat-trick but fired wide from close range. The Citizens did gain a lifeline when English striker Jason Kabia pulled one back with a header from Jeffrey Chetcuti's left-wing cross. The Citizens, then under the charge of Edward Aquilina, piled the pressure on Hibs in the dying stages. Nicky Saliba guided the ball into the net with eight minutes remaining but referee Lorry Sammut had stopped play for a foul by Kabia on Michael Woods. Valletta screamed 'penalty' when the advancing Gilbert Agius appeared to have been fouled in the box but their appeals were turned down by Sammut. Hibernians: C. Vella, L. Attard, E. Camilleri, S. Vella, M. Woods, M. Spiteri (G. Stivala), C. Scerri, G. Lawrence, D. Carabott, D. Attard, R. Docherty. Valletta: R. Cini, J. Camilleri, J. Chetcuti, K. Laferla, D. Debono, I. Zammit, G. Agius, N. Saliba, J. Kabia, J. Zarb, D. Doncic.